Announcing Threat Centered Revolver in Phoenix! Good news for revolver owners! 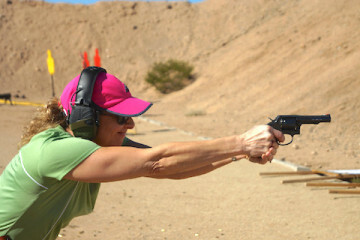 I’ll be back in Phoenix, AZ this November 11th & 12th, teaching my Threat-Centered Revolver course! In the last couple of years this has become my most popular course, and for good reason — very few people in the training world take the revolver seriously as a defensive tool. Many don’t understand them or, worse, don’t like them. That’s certainly not me! Not only do I understand the revolver at a level most people don’t, I appreciate its unique capabilities and uses as a self defense arm. As a result, students come out of my class with a greatly increased understanding of their gun and the skills to take advantage of it. This class is especially appropriate for those with snubnose revolvers! Phoenix is wonderful in November. While the rest of the country has turned cold and wet, Phoenix is still dry and warm. Great training, great weather — what more could you ask for? P.S. : The last time I taught in Phoenix, we unknowingly scheduled the class for the same weekend the NCAA Final Four was in town. Flights and hotels were double to triple their normal rates! If you balked at attending this course last February because of those ridiculously high lodging and transportation costs, you’ll be happy to know that hotels and airfare for this date appear to be back to normal. Book now! New class added in Indiana! Hey Buddy!, I found this information for you: "Announcing Threat Centered Revolver in Phoenix!". Here is the website link: http://www.grantcunningham.com/2017/05/announcing-threat-centered-revolver-phoenix/. Thank you.